This is a fictional story of two children who are hurled back in time in their quest to solve present day problems with an old Cumbrian steam engine in the National Railway Museum in York. Their adventures follow the real story of old Coppernob. They face danger; there are problems that have to be solved and mysteries to be unravelled. How can they get back to their own time? Can Coppernob’s old driver help them and how can they fulfil their promise to him? 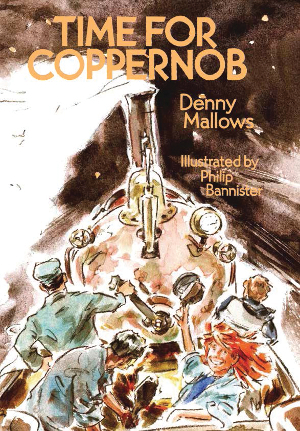 Time for Coppernob is illustrated throughout with beautiful watercolour illustrations by Philip Bannister. Publishing fiction represents a new venture for the Cumbrian Railways Association, but this special story promotes the history of a Cumbrian engine in a unique way. Denny Mallows has written a book for children aged 7+ and adults of any age. Sarah aged 10 writes “What a great story” and Peter, a grown up, says “It is compelling and fun”. Denny has a background in education and psychology. She handles issues many children have to face and there are themes running through this gripping story that will enchant children and adults alike. Click HERE to download a taster in PDF format.